Closer collaboration between Bentley design and engineering products and Trimble’s software platform means translating design models into construction models has just got easier. The first week of November 2014 was a busy time for the growing relationship between Bentley Systems and Trimble. In simultaneous user conferences 5,000 miles apart, key customers of both companies were being briefed on recent advancements which allow users of Bentley design and engineering products to transfer data directly into Trimble’s construction software platform. The goal is straightforward interoperability of construction modelling data from design to construction. Industry research quoted by Trimble claims 90 percent of vertical buildings are delivered late, with 40 percent of them over budget. As Rob Painter, general manager of Trimble Buildings, told attendees at his company’s user conference in Las Vegas, the alliance with Bentley seeks to counter the three root causes of such problems: ineffective planning, communications and collaboration. As defined by both companies, aspects of construction modelling include modelling of temporary works, intelligent positioning, “splitting and sequencing”, detailing for fabrication, workface planning, construction work packaging, and support for distributed construction — referencing and supplementing design modelling deliverables. Bentley has assembled a large software portfolio in recent years that make it a leader for enterprise-class design and engineering projects, with some of its software being used by construction firms. Trimble has also been acquiring and building an extended software portfolio from its roots in construction and related field work, with some of it extending toward design/engineering. While they compete in a few areas (notably in structural engineering), there are many other areas in which joint customers move from using Bentley products to Trimble products in the design/construction cycle. Jointly developed data schemas to ensure data maintains semantic fidelity as information is passed. The use of Bentley iModels for construction deliverables to and from each company’s products when used together for project delivery. Working together to advocate for improvements to industry interoperability standards. Leveraging the other partner’s technology when it makes sense to improve workflow. The quintessential application — and the first one made available to customers — is the use of road design data to drive an earthmover or other piece of heavy construction equipment. The section of road is designed in Bentley Open Roads; the model includes all the elevation data Trimble needs. The information is packaged by Bentley ProjectWise as a Bentley iModel, a data container designed to share BIM information in a variety of neutral and proprietary formats. The iModel is transmitted to Trimble Business Center, where the right data can be forwarded to the field as needed. 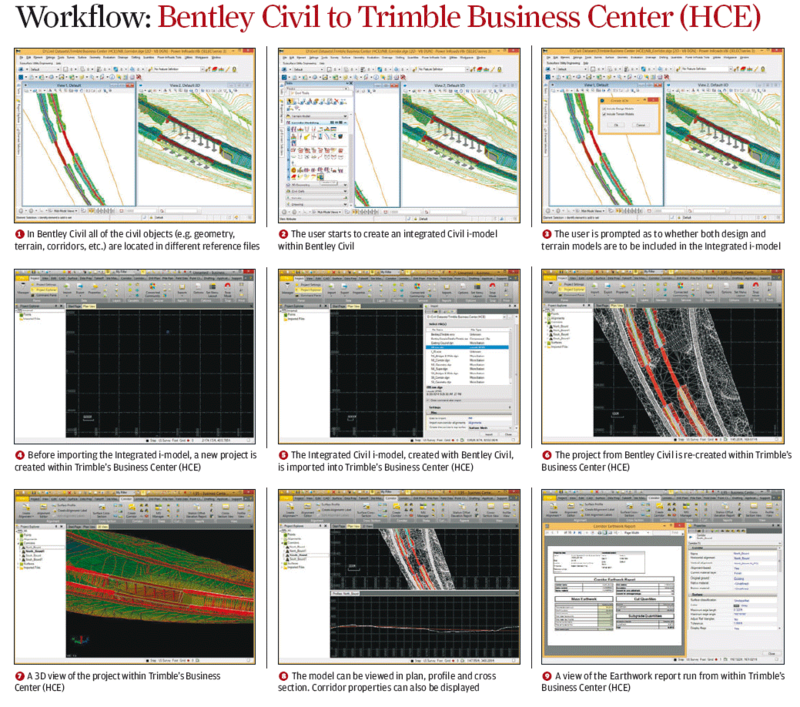 A view from Trimble Field Link, software for managing construction layout tasks with data sharing via Bentley i-models. “At a deep engineering level, we work closely, in person, to work out what goes into the iModel,” says Mr Vitelli. “Working through the iModel is the essence of our alliance.” So far Bentley and Trimble have co-released two schemas, one for field layout and another for fabrication. A third will be released “soon” says Mr Vitelli, but they are not ready to talk about it yet. Two new links in the chain are cloud-based data exchange technologies called Bentley Connect and Trimble Connect. (Both companies say the shared naming convention is not intentional). The data is sent from ProjectWise by Bentley Connect to the construction unit’s installation of Trimble Business Center, which has been updated to understand the incoming data from the Bentley iModel. Bentley and Trimble have agreed on a software development kit that allows Trimble Business Center to link to an installation of Bentley ProjectWise, or directly accept a Bentley iModel. For years paper plans have been the contractual documents between a design agency such as a regional department of transportation and a construction company. With early attempts to make the project digital, Mr Nichols says the export formats “were not of the fidelity needed, especially at the contractor level”. Now with greater fidelity possible in the handoff, the design teams are providing the more detailed landform information as horizontal, vertical, and cross sections. Construction teams are able to import the exact data they need for machine control without a second data input step. iModels are a data packaging scheme created by Bentley. Some have compared iModels to PDF documents, but Mr Vitelli — a former employee of PDF inventor Adobe Systems — says the comparison is weak. The preferred term used in the alliance is “construction modelling”. The data-driven execution of construction tasks is the common goal. “We want our users modelling knowing the data will go to the path of construction, to lay points, shoot lasers, install infrastructure, and remove earth, all on the back of that BIM model,” says Mark Nichols. On a practical level, there is not one all-defining BIM, says Mr Nichols, but three: a design BIM, a construction BIM and an operations BIM. Bentley and Trimble want their alliance to move beyond naming the different uses of information and get straight to the useful integration. The consensus schema built by Bentley and Trimble, in this example, would identify information common to both parties and make sure it flows freely. Bentley Navigator for project review and construction management. Bentley ProjectWise for content management and project collaboration. Bentley Open Roads for civil engineering design. Trimble Business Center, a geospatial design and delivery suite. Trimble Field Solutions for connecting design intent to the field. Trimble Field Link for connecting data to field tools. Trimble Quantm, for corridor planning and value engineering. Kiewit Construction is an early adopter. Andy Kayhanfar, director of Virtual Construction, Kiewit explains how the convergence of Bentley / Trimble is helping his business. Randall S. Newton (author) is Principal Analyst at Consilia Vektor. He has been writing about AEC since 1987.